"If you want to be rich, you need to be financially literate", said famous American author, Robert Kiyosaki. UTI Swatantra, an investor education initiative, helped people add to their wealth by increasing their nancial knowledge. It is a myth that nancial planning is dif cult. People often shy away from planning because of the supposedly complex calculations involved. UTI Swatantra provides various online tools and calculators to assist investors. Through: Goal calculator, risk analyser, retirement calculator, etc. Ask and the advice shall be given by leading nancial experts! Sometimes, you may have the money but not the guidance to use them optimally. This is where UTI Swatantra comes to the rescue. You cannot be nancially independent without investing. At the same time, formalities and paperwork cannot stop you from investing. UTI Swatantra understands this and makes the entire process hassle-free for you. There is always safety in numbers. A decade ago you may have felt lonely as a Mutual Fund (MF) investor. Today, it is a different story. According to RBI and AMFI, a decade ago, MFs represented about 10% of bank deposits, today that gure is about 20%. This means more investors feel MFs make an attractive long-term investment option; they feel Equity MFs are much more than just a substitute for direct stock market investing. As UTI Mutual Fund presents UTI Swatantra that recently completed 10 years. it is also worth noting that it is 25 years since MFs were opened up to the private sector. MFs have grown at an attractive Compound Annual Growth Rate (CAGR) in the past two decades. At times, they have also beaten the Bombay Stock Exchange and even gold. Now don’t you wish you had seen this coming. The good news is that it is never too late. Smart and dedicated fund managers have worked hard and proved themselves over the years by ensuring your investments are not just safe but also earn good returns. As we look at the next decade of economic growth for India, remember that you can bene t from their expertise too, by investing in the right companies and stocks that will run with the economy or in many cases outpace it. And the best way for you to do that is to park your funds today with MFs that suit your Goals, preferably in frequent doses. Equity MFs help you build wealth. Debt MFs, on the other hand, maintain stability in your portfolio. 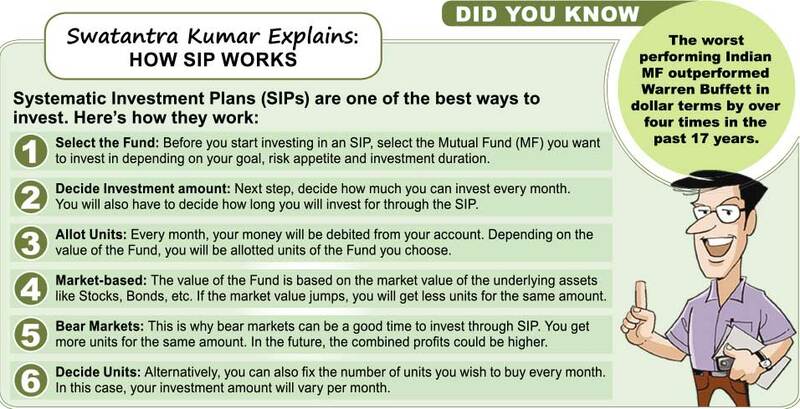 And what better time than now, so you can look back a decade later and say, "mutual funds sahi tha."